Slice eggplant, and cut each slice into sixths. Place into a large bowl, add 3 tbsp salt. Toss to coat, and pour in enough water to cover – let sit for 30 minutes. Drain, and rinse thoroughly to remove salt. Preheat oven to 450 degrees F – arrange eggplant slices onto a large baking sheet, and cook for 20 to 25 minutes. Meanwhile, start the gravy. Heat 3 tbsp of olive oil in a large skillet. Add the onions and jalapeños, and cook for 5 to 7 minutes. Meanwhile, toast cumin seeds in a small skillet on the side. Once the seeds start popping, add to the onions and jalapeños. Stir in the garlic, ginger, and spices, and cook for an additional minute. 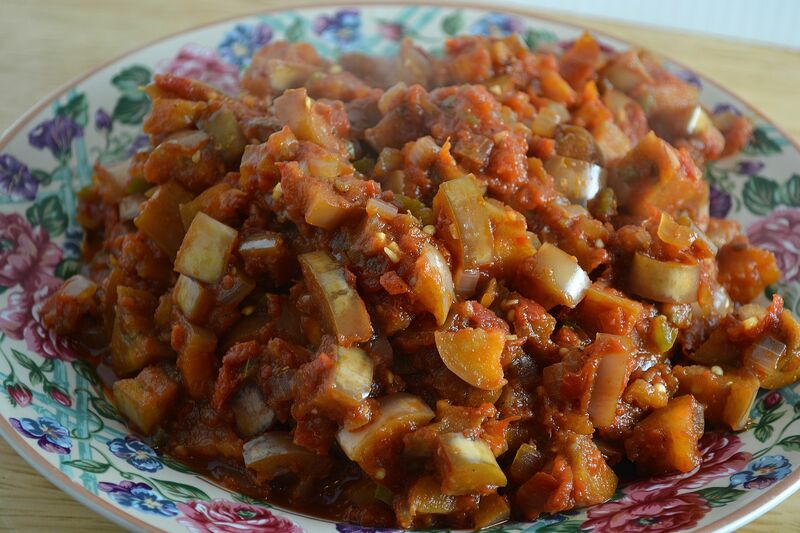 Stir in the crushed tomatoes, and let simmer until the eggplants are done roasting. Remove the eggplants from the oven, and stir into the gravy – let simmer for an additional 5 minutes or so, adding water to adjust the consistency if necessary; serve immediately.